Glucagon-like peptide-1 (GLP-1) released from intestinal L cells in response to nutrients has many physiological effects but particularly enhances glucose-dependent insulin release through the GLP-1 receptor (GLP-1R). GLP-1 7–36 amide, the predominant circulating active form of GLP-1, is rapidly truncated by dipeptidyl peptidase-4 to GLP-1 9–36 amide, which is generally considered inactive. Given its physiological roles, the GLP-1R is targeted for treatment of type 2 diabetes. Recently ‘compound 2’ has been described as both an agonist and positive allosteric modulator of GLP-1 7–36 amide affinity, but not potency, at the GLP-1R. Importantly, we demonstrated previously that exendin 9–39, generally considered a GLP-1R antagonist, enhances compound 2 efficacy (or vice versa) at the GLP-1R. Given that GLP-1 9–36 amide is the major circulating form of GLP-1 post-prandially and is a low affinity weak partial agonist or antagonist at the GLP-1R, we investigated interaction between this metabolite and compound 2 in a cell line with recombinant expression of the human GLP-1R and the rat insulinoma cell line, INS-1E, with native expression of the GLP-1R. 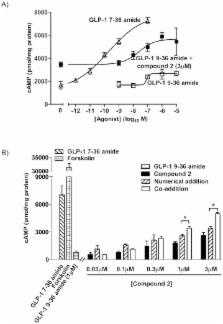 We show compound 2 markedly enhances efficacy and potency of GLP-1 9–36 amide for key cellular responses including AMP generation, Ca2+ signaling and extracellular signal-regulated kinase. Thus, metabolites of peptide hormones including GLP-1 that are often considered inactive may provide a means of manipulating key aspects of receptor function and a novel therapeutic strategy. The physiology of glucagon-like peptide 1. Glucagon-like peptide 1 (GLP-1) is a 30-amino acid peptide hormone produced in the intestinal epithelial endocrine L-cells by differential processing of proglucagon, the gene which is expressed in these cells. The current knowledge regarding regulation of proglucagon gene expression in the gut and in the brain and mechanisms responsible for the posttranslational processing are reviewed. GLP-1 is released in response to meal intake, and the stimuli and molecular mechanisms involved are discussed. GLP-1 is extremely rapidly metabolized and inactivated by the enzyme dipeptidyl peptidase IV even before the hormone has left the gut, raising the possibility that the actions of GLP-1 are transmitted via sensory neurons in the intestine and the liver expressing the GLP-1 receptor. Because of this, it is important to distinguish between measurements of the intact hormone (responsible for endocrine actions) or the sum of the intact hormone and its metabolites, reflecting the total L-cell secretion and therefore also the possible neural actions. The main actions of GLP-1 are to stimulate insulin secretion (i.e., to act as an incretin hormone) and to inhibit glucagon secretion, thereby contributing to limit postprandial glucose excursions. It also inhibits gastrointestinal motility and secretion and thus acts as an enterogastrone and part of the "ileal brake" mechanism. GLP-1 also appears to be a physiological regulator of appetite and food intake. Because of these actions, GLP-1 or GLP-1 receptor agonists are currently being evaluated for the therapy of type 2 diabetes. Decreased secretion of GLP-1 may contribute to the development of obesity, and exaggerated secretion may be responsible for postprandial reactive hypoglycemia. Tissue and plasma concentrations of amidated and glycine-extended glucagon-like peptide I in humans. Glucose sensitivity and metabolism-secretion coupling studied during two-year continuous culture in INS-1E insulinoma cells. Rat insulinoma-derived INS-1 cells constitute a widely used beta-cell surrogate. However, due to their nonclonal nature, INS-1 cells are heterogeneous and are not stable over extended culture periods. We have isolated clonal INS-1E cells from parental INS-1 based on both their insulin content and their secretory responses to glucose. Here we describe the stable differentiated INS-1E beta-cell phenotype over 116 passages (no. 27-142) representing a 2.2-yr continuous follow-up. INS-1E cells can be safely cultured and used within passages 40-100 with average insulin contents of 2.30 +/- 0.11 microg/million cells. Glucose-induced insulin secretion was dose-related and similar to rat islet responses. Secretion saturated with a 6.2-fold increase at 15 mm glucose, showing a 50% effective concentration of 10.4 mm. Secretory responses to amino acids and sulfonylurea were similar to those of islets. Moreover, INS-1E cells retained the amplifying pathway, as judged by glucose-evoked augmentation of insulin release in a depolarized state. Regarding metabolic parameters, INS-1E cells exhibited glucose dose-dependent elevations of NAD(P)H, cytosolic Ca(2+), and mitochondrial Ca(2+) levels. In contrast, mitochondrial membrane potential, ATP levels, and cell membrane potential were all fully activated by 7.5 mm glucose. Using the perforated patch clamp technique, 7.5 and 15 mm glucose elicited electrical activity to a similar degree. A K(ATP) current was identified in whole cell voltage clamp using diazoxide and tolbutamide. As in native beta-cells, tolbutamide induced electrical activity, indicating that the K(ATP)conductance is important in setting the resting potential. Therefore, INS-1E cells represent a stable and valuable beta-cell model. Conceived and designed the experiments: GBW NL JL. Performed the experiments: NL JL. Analyzed the data: GBW NL JL. Wrote the paper: GBW NL JL. This work was funded by the University of Leicester. The funders had no role in study design, data collection and analysis, decision to publish, or preparation of the manuscript. Glucagon and glucagon-like peptides 1 and 2. Alanine scan of the opioid peptide dynorphin B amide. Homologous desensitization of the insulinotropic glucagon-like peptide-I (7-37) receptor on insulinoma (HIT-T15) cells.